Police continue to search for a 22-year-old who escaped lawful custody while at Worthing Hospital on Friday (April 6). Police said officers on patrol in Worthing town centre at shortly before 12.30pm on Friday identified a man who was wanted in relation to an assault in Brighton. But before he was arrested, he assaulted a police constable and made off from the scene, police confirmed. He was located and arrested nearby shortly afterwards, said police. Due to complaints of arm pain, the suspect was taken to Worthing Hospital for treatment, where he escaped from lawful custody, said a spokesman. "An area search was carried out without a trace, and the suspect remains outstanding at present," police said. 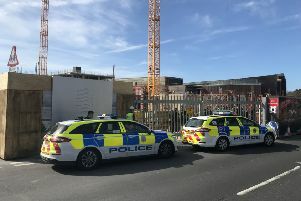 Police officers were positioned in Lyndhurst Road by Worthing Hospital, the High Street, Worthing, and the Waitrose car park on Friday afternoon as a helicopter scanned the area from above. Officers were seen climbing fences and stood on roofs by the gas holder behind Waitrose, with a police dog unit. At around 3pm the same day, a Lyndhurst Road resident was in her kitchen at home when a man jumped the wall, came into her house and ran through to the front door. She said: "I was really shocked. He was saying sorry as he came through my home. "Thank god my front door was open and he could just get out. It was such a shock."